This illustrated list of Columbia-Shuswap birds has a search feature to help you locate a specific songbird. 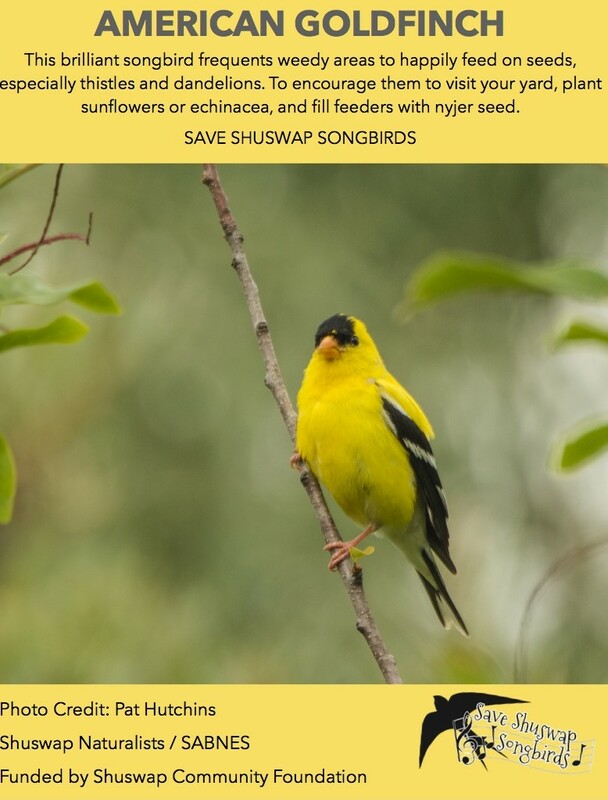 Save Shuswap Songbirds is a joint committee of the Shuswap Naturalist Club and SABNES. Our mission is to promote public awareness in the local community about songbirds, especially their value in our lives, and how we can help protect them by enhancing bird-friendly habitat. Could we live without birds? 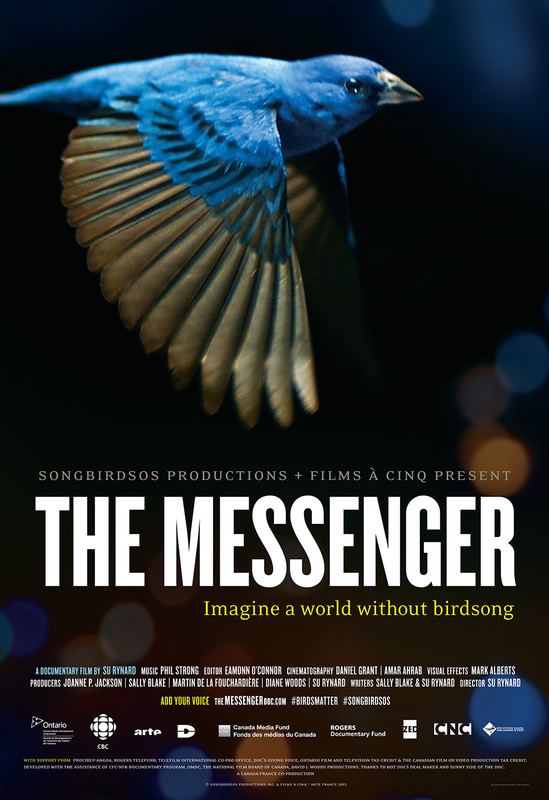 Our decision to form the committee was inspired by a growing songbird conservation movement highlighted by SongbirdSOS Productions, and brought to international attention in 2015/16 with the release of their documentary film, The Messenger. 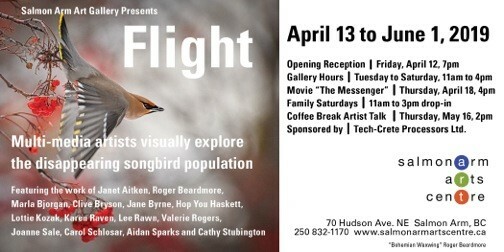 The film’s focus is the critical decline of songbird populations worldwide due to environmental conditions that are largely human caused, and it explores the reasons for our close bond with birds. “Could we live without birds?” is the question at the heart of this presentation. Along with visual and musical appeal, and inspiration for art and literature, songbirds are nature’s gardeners as they scatter seeds and control insect pests. They are an integral part of the ecosystem. The plight of songbirds has many causes. Their numbers are declining sharply from habitat loss due to development and agriculture, from overuse of pesticides, light pollution that interferes with migration and can result in high-rise collisions, climate change that affects their food supply, and domestic cat predation. In the Shuswap, 150 species may be seen mainly during warmer seasons and at least 35 species of songbirds have been recorded on the annual Christmas Bird Count in the Salmon Arm area. Watch for signs created by the Save Shuswap Songbird Committee posted around the foreshore and nature trails in Salmon Arm depicting some common songbird species. Get to know which ones might visit your yard and look for them on your walks; simply watching and listening to them will add to your enjoyment of being outdoors. Songbirds are adaptable, using every bit of habitat that is suitable, so you’ll see them almost everywhere. And that is why we believe it is critical to provide and preserve suitable habitat to help songbirds thrive. 1. Plant your garden with flowers that offer seeds in the fall, and shrubs that produce berries. Leave a few ‘weed’ plants in corners or along fences to attract small birds. 2. Shrubs and trees will provide natural nesting sites for robins, warblers and sparrows. Hang nest boxes in suitable spots for cavity nesters like chickadees and nuthatches. 3. Provide clean water with a bird bath, waterfall or water dish. 4. Bird feeders provide nutritious food for small birds that overwinter in our area. Sunflower and nyjer seed are good choices, available from local garden centres. Offer suet and water as well. Find out how to keep feeders clean (to prevent bird diseases) from bird guide books and on the Internet. 5. Discourage birds from flying into windows by placing cutouts of hawks on the glass, using strips of tape or hanging net curtains to break up large expanses of reflective glass. 6. Keep pet cats indoors where they will be healthier and will not contribute to the millions of songbird deaths each year in Canada. 7. Avoid using pesticides and other poisons around your garden. Let the songbirds do the work of keeping insect pests under control. Problem weeds can be dug out by hand, but leave others to attract insects—food for songbirds—or to provide nectar for hummingbirds. 8. Join a local naturalist group and go bird watching to learn more!